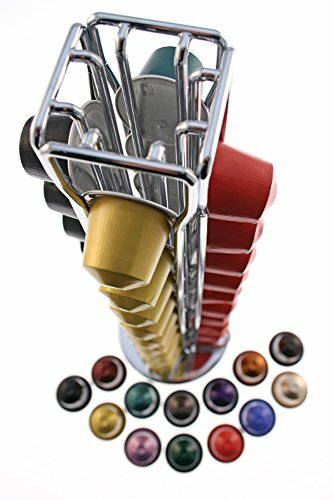 So you’ve finally picked out the perfect espresso pod machine for your household (or maybe you’ve had one for years) but the thing you didn’t think about until now is “What should I use as a holder for my coffee pods or k-cups?” This is a great question, and we hope to help you find the perfect solution for your espresso machine and home. Which type of coffee or K-Cup holder should you get? There are different types of holders and storage units for coffee pods and K-cups. One type of storage unit may be better than another depending on your types of needs. The three basic categories we will cover include drawer storage, a counter top display and a wall mount. Are coffee pod holders “one size fits all”? That’s a great question, we’re glad you asked! The answer is no; coffee pod holders are not necessarily one-size-fits-all. We can’t list every conceivable coffee pod brand on this site, but some espresso pods are larger or smaller than others. The most common pod is the Keurig cup, or K-Cup. Keurig cup holders are compatible with many other brands of similar capsule size including Verismo and Dolce Gusto. With a little bit of research, you should be able to discover if a K-Cup holder will work for your needs. If you have a nespresso espresso machine, you will want a Nespresso-specific coffee pod holder. Nespresso capsules are much smaller in size than K-Cups, so you will want a significantly more compact storage unit. The most popular type of coffee pod storage is a draw storage unit for a few different reasons. One, this doesn’t take up any additional counter space. Your espresso machine already takes up some space on the counter… why not maximize that space? A drawer storage units sits directly underneath your espresso machine. This will raise your espresso machine a couple of inches or so, so it may not be great if your espresso machine is already hitting the underside of your kitchen cabinets, but if you’re not limited on vertical space then this is a great choice. These come in many different styles including plastic, glass, wood, mesh wire and even bamboo. They can be bought to match the existing look and feel of your kitchen. These are often stackable so again if vertical space isn’t an issue, you may be able to stack two or three of these to have a large amount of storage for your coffee pods. For more details including specs, sizing, reviews and even color options, click on “read more” under each product. The DecoBros Drawer Holder is one of the best-selling coffee pod holders on Amazon and has over 4,5000 reviews. If you’re looking for a simple drawer to store your espresso capsules, then you surely won’t be disappointed with your purchase. This drawer is exactly what it looks like and nothing more. Unlike other drawers, it is quite sturdy, even when two or three are stacked on top of one another. They each have four little feet on the bottom to keep your counter top protected. A rubber-coated mat on the top of the drawer keeps vibrations from your espresso machine to a minimum. The only negative to this product is that if your espresso machine is placed under a cabinet, and you don’t have the option to move it elsewhere, then it likely won’t work for you. Ask yourself this question: If you raise your espresso machine over 3″, will you still be able to open the top to place in your espresso capsule? If not, you might look for a counter top solution like a carousel instead of a drawer. I bought two of these drawers and loved them so much that a bought a third a short time after. Even when stacked three high, they feel very secure. No shifting when opening or closing any of the drawers, and there is really no vibration from my Keurig. The rubber feet are great because they don’t slide on the plastic top of my fridge and sink nicely into the foam top of the chassis underneath keeping it secured in place. The top of this drawer system seems pretty rigid, as I have not yet noticed any drooping from the weight of the Keurig placed on top. The Mind Reader ‘Anchor’ Triple Drawer is a great coffee pod holder for home or even in the office. With its modern and sleek design plus the number of color options, you are sure to find one that will look beautifully in the kitchen or living space. While there are cheaper plastic K-Cup storage drawers out there, this one is made of quality, durable plastic. The drawer should not sag on the top, they are stackable, and should last for years to come. Users report that every facet of these drawers were designed well, unlike other comparable storage drawers. One huge benefit to this drawer system is that there are there drawers instead of one large one. It’s not a huge selling point for some, but others love to open a tiny drawer to grab a pod rather than slide one large one open. This really comes down to personal preference. When I saw this one with three drawers instead of one, I decided to purchase it because in order to open the single drawer, I have to move everything away from the front of the espresso machine just to get a couple K-cups out. Having multiple drawers is simply more ergonomic. I am in love with thse drawers! They work great on my coffee island and helps to keep my espresso pods organized and tidy. I do worry about it breaking because it is made of plastic rather than metal, but I have had this going on six months and it is still working wonderfully – and that is with daily use, multiple times a day! The Mind Reader “Anchor” Single Drawer for Nespresso capsules is the newest generation of single drawer coffee pods. Forget those cheap wire mesh coffee holders with flimsy construction and sticky drawers. This holder is designed to last with superior materials and attention detail.It has a patent-pending heat-resistant panel meaning you can place your coffee machine safely on top without worrying. The panel ensures the drawer doesn’t sag and prevents the heat of your coffee machine from compromising the coffee pods below. The single drawer is capable of holding up to 50 Nespresco capsules. The capsules are in five rows to offer simpler access and help you organize your favorite coffee flavors. It has a chrome handle that offers a stylish and attractive appearance. A con to this coffee pod holder is that it’s very large. The holder is large for some users with a length of 38 cm. It is ideal for people looking for a big capsule drawer. Another con is that the coffee machine may overlap: Citiz machines are slightly wider than the top of the drawer. They fit neatly but overlap slightly. It appears as if the drawer was designed for Nespresso machines because they fit neatly without overlapping. This superb holder is much better than coffer drawers that I have used in the past. It is sturdy and made with strong materials. I really like it because it perfectly sits below my Nespresso machine. The holder ensures everything is at hand when preparing my favorite coffee. I can organize all pods in order of the coffee strengths and flavors that I like. Drawer may fail to close properly: This usually occurs when a very heavy coffee machine is placed on top of the drawer. The Mind Reader “Anchor” Double Drawer is a variable pod capacity holder that is built to last. It is a 2 sliding drawer style and can hold 20-50 pods depending on the size of the individual pods.It is made of quality materials with a very sturdy design. For instance, it is made of durable upscale plastic that matches most Single Serve Coffee machines. It has a very strong construction that allows users to place their machines directly on top. Moreover, this pod drawer is an ideal choice for keeping your pods safe and neatly organized. It can help you save your counter space by simply placing your machine on top. The holder has six rows which you can use to organize your favorite coffee flavors. The model is compatible with other pods including Dolce Gusto Pods, CBTL Pods, Verismo pods and Rivo pods. I like this triple drawer. 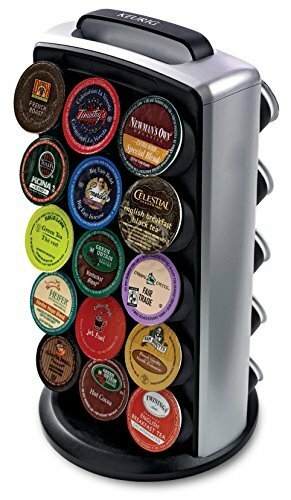 It works perfectly on my coffee and helps me keep my coffee pods organized. I have used it for six months and it is still working perfectly. I used to worry about it breaking during the first days because it is made of plastic. I’m used to it now and I use it multiple times a day. It looks good and it is more convenient to open a drawer without having to push everything away from the front of the coffee machine. I like it and I’m very satisfied with it. The Amazon Basics Coffee Pod-Storage Drawer is a great foundation for your coffee machine. It is sturdy and a bit sophisticated. It can be kept below the machine to save counter space in your home or office. It stores your K-Cup pods in an organized manner and keeps them protected while making them more accessible. It has 3 easy-to-open drawers. The drawers glide against each other smoothly and each can hold 12 K-Cups. It is very easy to remove, load or organize your pods with this storage drawer.The drawer is a great replacement for wire-mesh pod holders because it is built to last. It maintains its structure even when used a machine is placed on top. The panel protects K-Cups below. It comes with soft anti-slip pads at the bottom to protect counter-top surfaces and ensure secure placement. Additionally, this AmazonBasics Pod Storage complements most house decors. It has a solid black color and drawer handles have a shiny mirror finish. I like this spacious pod storage drawer. It allows me dispense using the standard packaging pods for K-Cups. I can pull the drawer smoothly and select my favorite pod instead of reaching a box of pods. The three drawers make it very easy for me to arrange different types of juices, cocoa, tea and coffee in columns for easy and quick access. The drawer is just perfect for my needs. 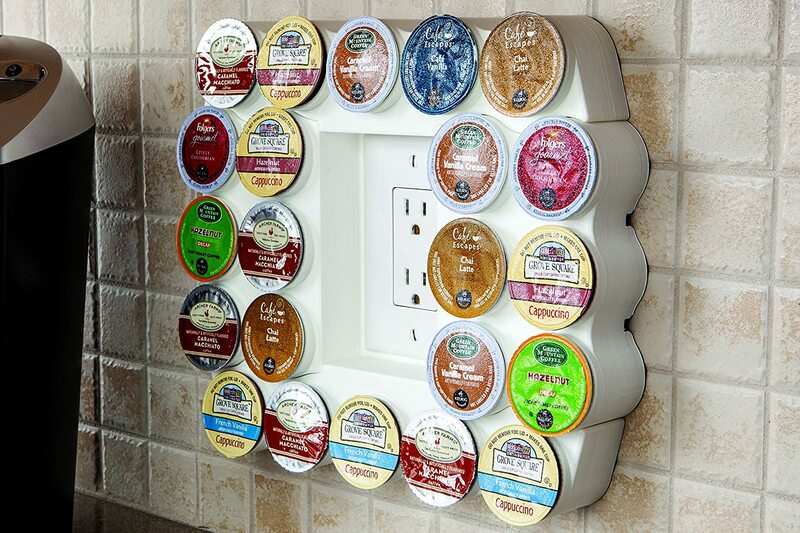 The next type of K-cup storage would be a counter top display. These may be for those folks that really want the espresso nook to be a highlight of the kitchen. Where draw storage is meant to hide the pods, counter top displays are meant to show them off. If you have guests over, this will look very inviting to them and will also show them that you potentially have multiple flavors of coffee to choose from. 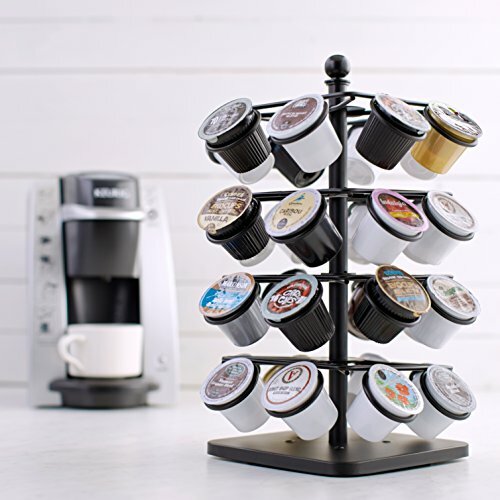 The CK-Cup Carousel by Nifty keeps all your K-Cups neatly organized. It has a lazy-Suzan base that rotates 360 degrees. Subsequently, it is very easy for you to find and pick your favorite K-Cup flavor. The classy powder-coat finish and sleek design gives the carousel an attractive look and complements most kitchen countertops.It is ideal for people with limited countertop space but want to hold their coffee pods in one place and reduce clutter. The carousel holds up to 35 K-Cups and features a quality construction that is built to last. Moreover, no assembly is required because its comes assembled and ready to use. This coffee pod holder is easy to clean; it only needs to be wiped with a damp cloth. No assembly is required and it requires no extra parts. It spins easily, is highly portable, and overall does what it says it will do which is sometimes all you can ask for in a product. I picked up this upright K-Cup holder because I don’t have much countertop space. I’m very pleased with this carousel. It stores all my coffee flavors and takes very little counter space. I can now access and refill my pod easily when necessary. It complements my countertop and matches my coffee machine. I really like it when my guests pick their favorite coffee flavors from the selection of my K-Cups. The carousel looks great next to my coffee maker and I can proudly say it perfectly does what it promises. 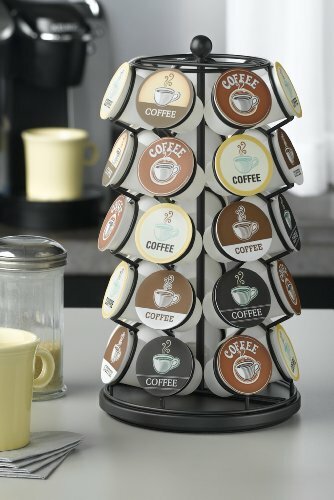 The Keurig K-Cup Carousel Tower can hold up to 30 K-Cups. You can use it to store your Keurig coffee, iced beverages, cocoa and tea in one accessible location.The carousel has a lazy-Susan that spins smoothly for easy access. In addition, it has an easy-to-grip handle at the top that makes it very easy to carry from one point to another. It is made of string plastic material and fits well on any typical countertop. It matches the interior décor of most modern kitchens thanks to it stylish silver and black finish. 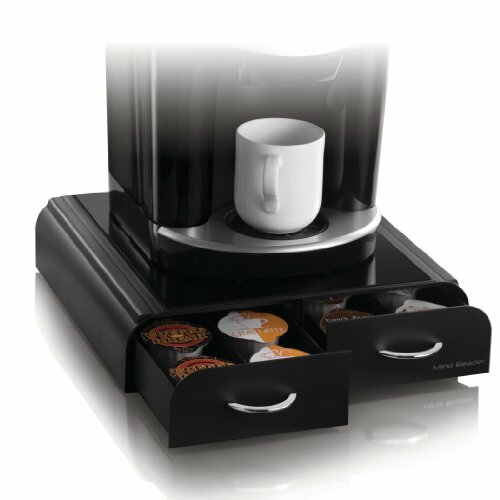 This handy carousel will be a perfect addition in your kitchen or office, especially if you have a K-Cup machine. However, it is good to remember that K-Cup packs aren’t included in the set and you may have to buy them separately. It is very compact and sturdy. I keep it on my counter and it doesn’t take a lot of my valuable counter space. It rotates smoothly and looks very nice sitting next to my Keurig coffee maker. I usually move it over to the dining table and present it to my visitors. Most of them spin it around smiling to see the selections that match their taste. Its 30 K-Cups capacity allow me to always have my favorite selection of beverages at my fingertips. The cups are very easy to recognize in any position and the overall appearance is cleaner and more attractive than tree-type carousels. K-Cups may fail when carousel is spun vigorously. The Mind Reader “The Wall” is a two-sided K-Cup holder. Each side can hold up to 25 K-Cups and the entire holder can hold up to 50 K-Cups. This cool holder is great if you are looking for means to maximize your coffee pods storage. It allows you to store all your cups sleekly. It features a patent-pending self-locking mechanism that keeps all cups in place even when tilted perpendicularly. You shouldn’t be worried of your coffee pods falling out. The display rack is ideal for use in a large office as well as busy homes. You will no longer have to hide your coffee pods in drawers and cabinets with this fun pod holder. The holder will let you display all your pods in style. It is made with HIPS, a High Impact Plastic that is safe, tough and designed to last. I love my Keurig machine and this holder improves my experience with my coffee machine. It provides me with enough space to store my K-Cups neatly and organized for easier access. I even use one side to keep my favorite coffee flavors and the other for my visitors. I haven’t experienced any problem when placing or removing my K-Cups in their individual holders. I usually drag the holder because it doesn’t spin and the K-Cups don’t fall. I’m very happy with this rack. Do you hate digging through your jumbled box looking for your favorite coffee flavor? If this is the case, then you may need the AmaonBasics Coffee Storage Carousel.The storage carousel stores 32 K-Cups conveniently displaying the color and name of each flavor or blend. It saves your valuable tabletop or countertop surface and adds style to your office or kitchen with its black-coat finish and sleek design. Standard K-Cups fit neatly in their individual holders for a neat display. The holder is designed for effortless storage and removal of your favorite coffee. It features a rotatable base to allow you find your favorite coffee by simply spinning it with your fingers. It comes with a top handle, coffee storage base, short plastic sleeve, support bar, 4 pieces of storage shelves and 4 long plastic sleeves. This storage carousel is one of my best Amazon purchases. It is very easy to assemble with easy-to-follow instructions. It has an attractive finish and doesn’t have loose attachments or joints. I like the fact it doesn’t lock. Instead, it spins freely without rocking. Its open design gives me easier access to my coffee pods. I no longer have to dig through the cabinet to fulfill my caffeine fix. The storage carousel looks costlier than its actual price thanks to its black-tint appearance and sleek finish that blends nicely with my black Keurig machine. I’m very happy with it because it does all the tasks I was looking for perfectly. Individual racks don’t spin independently. The racks spin as a single unit. The Swissmar Capstore Vista Storage Rack in one of the best coffee storage products in the market today. 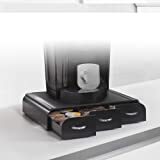 It stores your Nespresso coffee capsules in an organized, clean and easy-to-reach manner.The unit stands on a turntable storage unit that allows you to access your favorite coffee blends from all sides. It can store up to 40 Nespresso capsules. It is designed with a chrome wire frame and blends with any décor thanks to its polished stainless steel finish. The rack makes an ideal gift for people living in space-efficient apartments, students and anyone else who wants to reign in the kitchen. The entire unit swivels smoothly allowing for full accessibility. 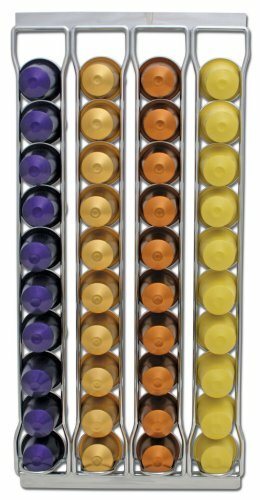 I have been looking for a Nespresso storage unit that takes up little space but stores a lot of capsules for a long time. I really like its compact design because I’ve many items on my kitchen counters and adding my Nespresso took up more of my limited space. It is a high quality storage rack and looks good next to my Nespresso machine and stainless steel appliances. It complements the décor of my kitchen. I no longer have to fumble through the capsule box in my pantry to get my favorite coffee blend. The stand allows me to store up to 40 capsules and access them easily when I need to fulfill my caffeine fix. It rotates effortlessly on ball bearings and the construction is quite rigid with a sturdy, weighted and stable base. I’m satisfied with this unit and I highly recommend it for anyone with limited counter space. Loose screws can cause unit to slant. Must keep screws tight. The third basic type of coffee pod storage would be a wall mount. While this can look very lovely and be extremely practical, especially as it takes up no precious counter space, this is also the least versatile option. Unless you have the perfect spot for your espresso machine (right by a wall), this may not be the most practical solution. The wall display may be in the way of opening cupboards, or you may not have a wall anywhere near your espresso machine. That said, when positioned correctly, it can be a very lovely and practical display. 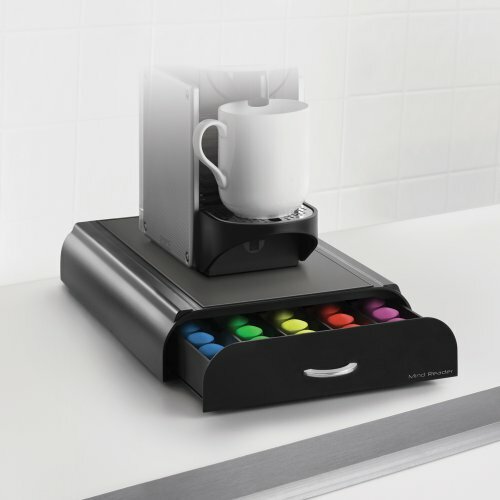 The Swissmar Mountable Storage Unit is designed to keep up to 40 single-serve Nespresso coffee pods neatly organized and accessible. The unit is wall mountable which helps in saving countertop space.A set of two adhesive strips (it appears they are velcro adhesive strips) makes it easy to hang because you don’t have to drill holes in the walls, although some choose to drill holes in the walls for peace of mind. You can mount the unit horizontally or vertically depending on how you intend to organize your pods. It makes it possible for you to access your favorite capsules and keeps your countertops tidy and neat. However, it is important to bear that capsules aren’t included in the unit and you may have to buy them separately. The unit is designed with a shiny chromed wire frame and polished stainless steel finish that makes it blend well with any kitchen décor. The storage unit has made it easy for me to manage my Nespresso pods easily. It is simple and holds my capsules perfectly. I mounted my unit horizontally and I can now access my favorite coffee flavors easily. It came with a strong sticky Velcro that has withstood the weight of the entire unit for two years now. I like this unit because it works as intended and has helped me keep my counter tops neat and clean. The Mind Reader Fridge/Wall Dispenser is a unique coffee pod dispenser that sticks to any smooth surface including walls and refrigerators. 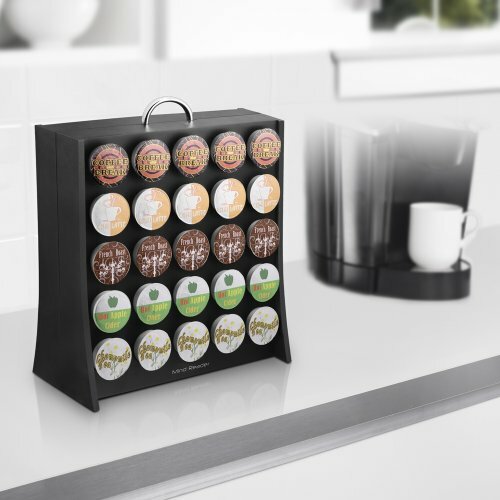 It comes with a strong self-adhesive and magnetic mount to keep it on place.It is ideal for people with limited counter space but want to keep their coffee pods at hand. This dispenser saves a lot of your counter space and it is ideal for both homes and offices. It even has a cork board at the top where you can post important messages or notes. With this dispenser, you will no longer need to search for your coffee flavors. The dispenser holds up to 20 single serve K-Cups coffee pods and keeps them neatly organized. Moreover, it has an open view that allows you to pick your favorite coffee flavors easily. It is made to last with high impact plastic and attention to detail. I really like this dispenser. It is a great product that keeps all my K-Cups neatly organized without occupying my counter space. It comes with a quality tape to mount on the wall, but I have hung mine on the side of my fridge. It is exactly what I wanted because my Keurig coffee machines sits right next to my fridge. Subsequently, I pick my best coffee flavor in the morning without wasting time. The K-Cups fit well in the individual holders and I can put reminders, notes and important messages on the cork board. 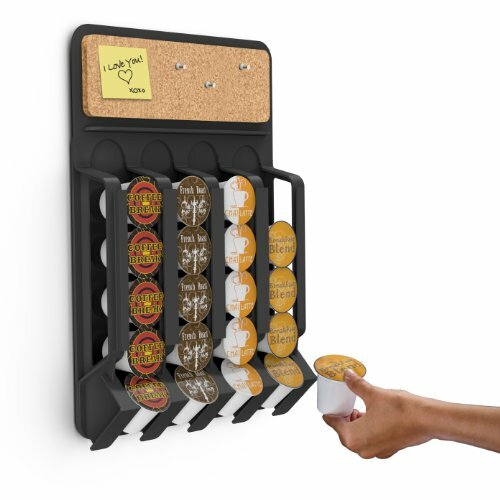 The Café Wall Caddy is a 22-pod holder that allows you to store your K-Cups on the wall next to your single-serve Keurig coffee machine. It is space saving and very easy to mount on your kitchen walls. It makes use of the existing electrical outlet to attach to the wall and doesn’t cause any wall damage. 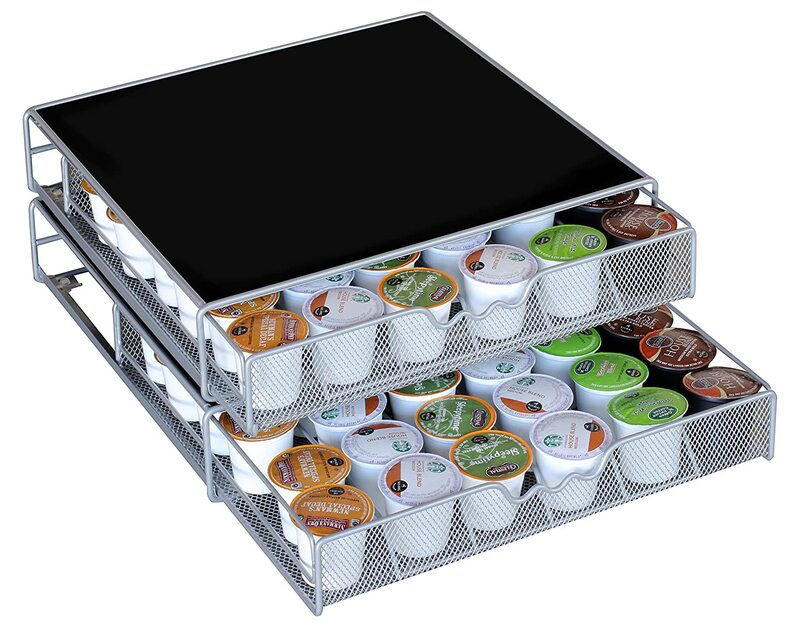 It makes your K-Cups more accessible and frees up your valuable countertop space.The modular design of this caddy makes it possible to remove or add rows for the perfect installation. It is the ideal storage solution for your coffee pods, especially if you want to free up your counter space. Forget the fragile China-made pod holders that take a lot of your countertop space. This wall caddy is made in the USA and comes with a 1-year manufacturer’s warranty. It is perfect for fitting on your kitchen walls because you don’t have to drill mounting holes. This wall caddy keeps my K-Cups firmly in place. It is great for my small apartment because it isn’t permanent and saves my counter space. Moreover, I don’t have issues with it taking up the space on my wall. It was very easy to install on the electrical outlet next to my coffee machine. I can now organize my favorite coffee pods and access them easily when making coffee. I like its space saving design that allows me to store all K-Cups close to each other. I highly recommend this wall caddy to college students and people living in an apartment with limited counter space. Sign up to receive exclusive deals + discounts on coffee equipment! Anodynecoffeehouse.com is dedicated to bring you the best coffee equipment possible. Whether it's the best coffee maker, espresso machine, french press or cold brew device, we will present to you the best equipment for your needs. Follow our newsletter to receive exclusive coffee equipment deals + discounts. We feature the best espresso machines and coffee makers from top, industry-leading brands including KRUPPS, De'Longhi, Philips Saeco, Gaggia, Nespresso and more.